ceremony at the University of Phnom Penh February 10, 2011.
benefit to Cambodian strongman, Hun Sen.
rival he accuses of flexing its superior military muscle. and scuttling a fragile ceasefire agreed between the two armies. International Court of Justice have helped stoke nationalist fervour. said Ian Bryson, a Southeast Asia analyst at consultants Control Risks. discredit Thai Prime Minister Abhisit Vejjajiva ahead of the election. which last week he called “thieves” and “terrorists”. but Thailand says the land around the ruins was never demarcated. 2009 and refusing to extradite him to serve a prison term for graft. Thaksin also has much to lose by being seen as close to Hun Sen at this time, if nationalist sentiment rises in Thailand. 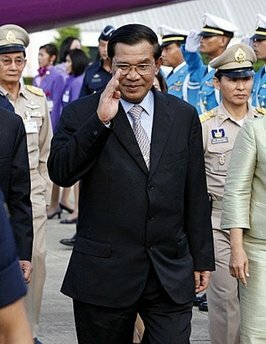 chance to assert himself within Cambodia’s military. Kurlantzick of the U.S-based Council on Foreign Relations think tank. probably will not either,” he said in a blog post. expected to be a hot topic at an ASEAN summit in Jakarta this weekend. that Hun Sen’s government is in no rush to find a solution. “Cambodia’s motivations are probably much simpler,” Eurasia Group analyst Roberto Herrera-Lim said in a research note.